No one asked for it, but I said I would. I recorded every comic book I read in 2018. I counted them by issue, so a 22 page floppy counts as 1 while a trade paperback would count as the 5 or 6 issues that comprised it. Once I had all this data, I did some analysis. What kind of book did I read more of? What publisher did I read more of? 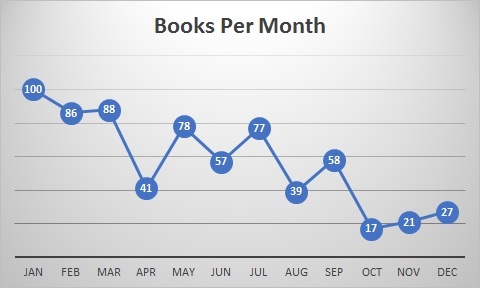 What time of year did I read more or less in? Some of the statistics surprised me, and hopefully you find these as cool as I did, or you can be concerned about my idiosyncrasies. I read 689 comics. 689! That’s an average of 57.4 per month, 13.3 per week, and 2 issues per day! To some of you, that might sound excessive. To those of you with 20+ per week pull lists, you might say “amateur”. Considering the amount of floppies I buy per month (15 on average), I think the number is pretty impressive. These volumes weren’t evenly distributed though. As per the below chart, I was way more enthusiastic in the 1st quarter than I was the rest of the year. 274 books read in those 3 months totaling 40% of my year. I think the big lesson here is if you set a year-long goal, stay mindful of fatigue so you stay on track. My top publishers are no surprise: Marvel and DC as the top 2 with Image in 3rd. It’s pretty safe to say it’s the same for the majority of comic readers. What surprised me was which publisher was number 1. I think it’s no secret that Davis and I tend to lean more towards Marvel than DC; but surprisingly, DC was my most read publisher this year with 46% of my consumption. Since this caught me off guard, I dug a little further. Turns out format was an important thing to consider. DC was my most read publisher in trade. Marvel was my most read in floppy. My weekly pull list is very Marvel heavy, but I spent a lot of time catching up on the rebirth books I hadn’t jumped on at the beginning. So as to not break this category down into fractions of a percent, I chose to highlight the most read “families” or groups of characters. It should come as no surprise that my most read groups are some of the most popular in the world. The important take-away for me is that my top 4 most read families account for just less than half of all my books, so my efforts to diversify my reading are working. It wouldn’t be Jacks of Trades if I didn’t use our rating system. I didn’t rate the books I read this year (no spoilers in case we do an episode on any of these), but I did take note of which books I purchased compared to which I borrowed from my local library. This might be the most important take-away of all of the crazy data tracking I did this year: nearly half of my reading came from my local library whether through physical copies or the digital app Hoopla. Your local library is an incredible resource and your taxes are already paying for it. Your library doesn’t have a lot of comics? Borrow the ones they do have. Budgets are based on what gets borrowed. You rent enough books, and they’ll get more. Regardless of the supply, support your library. It offers so much access to knowledge for so many people. It’s a great place and any fan of any kind of literature should help support it as much as possible. Recording all this data was fun and enlightening. I hope you enjoyed reading this post at least near as much as I enjoyed making it throughout the year. Can’t wait to get started on 2019’s spreadsheet and share it with y’all again next year.